We love putting together SMS marketing case studies. These presentations help you, the SMS marketing user, see exactly how businesses nationwide use our mobile communication service to increase sales. We recently had the pleasure of chatting with Mario over at What the FORK, a Pennsylvania based food truck. He’s used our SMS marketing service for quite some time. We wanted to dig a little bit deeper and learn more about how exactly he grew his list. Originally, Mario was looking for a way to fire out location info to qualified customers. Prior to partnering with Slick Text, his team was using social media as an outlet for communication. Every day, he was sharing location and schedule updates with Facebook fans and Twitter followers. On the surface, this might seem like a great technique. After all, social media is free, right? But, here’s the bad news. Social media exposure rates are insanely low. For example, less than 16% of Facebook fans even see your actual posts. Now, compare this to the average SMS marketing open rate, which sits at 99%. Obviously, there’s a clear winner in this comparison. With this statistic alone, it’s easy to see why Mario decided to switch over to SMS. Want to learn more about how he grew his list? Click through this quick presentation to get the nitty gritty details. 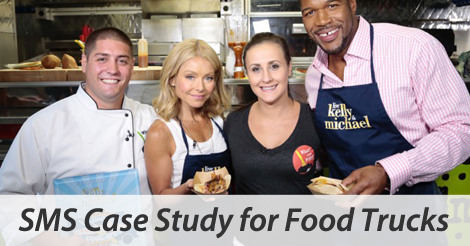 Ready to take your food truck business to the next level? Partner up with the best SMS marketing provider, SlickText.com. Give us a buzz at 1.800.688.6290 to learn more, or head over to the pricing page and sign up for a free plan. Having trouble connecting the dots? Shoot us an email at info@slicktext.com, and we’ll walk you through the sign up process. We’ll do everything we can to help you, the small business owner, succeed with SMS. 2016 is the year of the text message, don’t get left behind.